When excavations in prehistoric caves unearthed a flute which palaeontologists dated as some 30,000 years old, it was apparent that not just fascinating cave paintings but the productions of sounds from such instruments as flutes was already part of the repertoire of cultural techniques possessed by our ancestors. Music is a special art. It can instantaneously produce a huge range of emotional responses in us. Depending on its key, rhythm, orchestration or the coloratura of the human voice, it can send shivers down our spine, hold us breathless, move us to raptures of joy, put us in a good mood or make us want to dance, move us to tears, make us feel calm or put us in a state of deep relaxation. Yet at its core music is nothing more than pure mathematics. Music is a medium that miraculously changes mathematics into feelings. How can this be possible? The answer begins with a question: how is a sound produced? This was a question which OUBEY explored and he once put his thoughts on the subject down on paper, in the early morning hours of the 2nd December 1983 when he produced a trilogy of drawings in just half an hour. 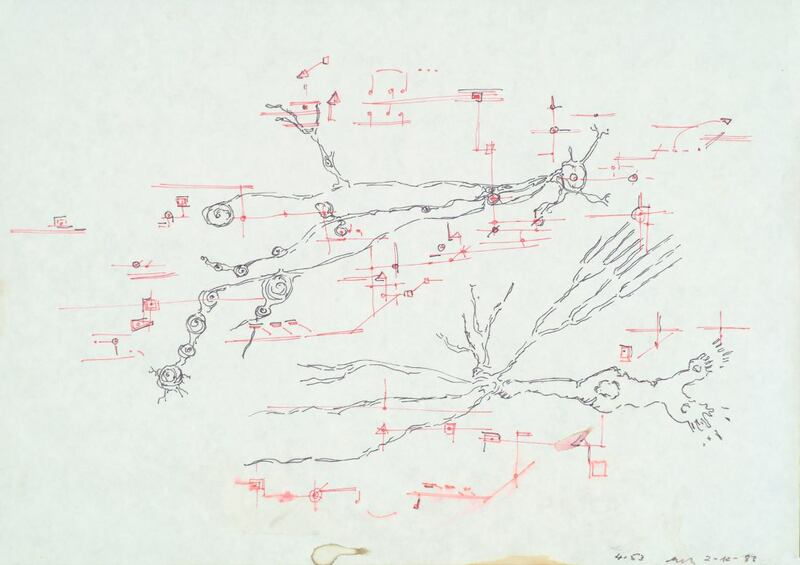 This artistic “musical topographical try” of an answer is a thoughtful consideration of the “Order, Structure and Organisation of Consciousness” and the interplay of “The Rhythmical and The Amorphous” as he himself noted on sheet 1 of the trilogy. OUBEYs sketches give us a very personal and close glimpse of the way in which his thoughts – his inner being – through his hand were given perceptible inspirational shape and form for the outside world. Something inherent in all his pictures – and indeed in every work of art – is laid open here for all to see. And perhaps this is the precise reason why so many viewers have found these drawings so particularly fascinating. Yet what kind of answer does scientific research offer? How is it possible that a sound wave can give birth to a musical tone? This is a question of equally deep concern to mathematicians and physicists, musicologists, musicians and brain researchers. It all starts with a relatively simple organ, the ear, which converts sound waves into electrical signals. The ear drum registers tiny variations in air pressure which are then amplified by the three small bones in the middle ear and transmitted to a membrane at the threshold of the fluid-filled inner ear. This snail-shaped organ then performs the astonishing act of splitting the sound into its component frequencies. From now on what is heard consists solely of nerve signals which shoot through the brain where “pure physics” miraculously becomes an almost inconceivably complex and intensely emotional act of sensory perception. And this is precisely what makes music such an endless source of fascination for so many people – because it is, quite literally, a sensational act of performance by the human brain. And yet, as if this were not already enough by itself, our brain doesn’t just transform soundwaves of various frequencies into musical sounds: the latest findings of “psychoacoustics” show that our ear can even sing. Brian Connolly described this artistic ability of our ear like this: Our inner ear has the ability to behave like an instrument that can produce its own tones. Many experimental musicians have used this ability of the human ear to turn listeners’ ears into participating performers in the creation of their music. One of the most exciting forms of musical creativity is the psychoacoustic phenomenon known as “otoacoustic emission”. This refers to sounds generated within the inner ear when it perceives certain sounds such as the emission of “difference tones“. It happens when two clear frequencies enter the ear – let’s say 1000 Hz and 1200 Hz – and the listener hears, as might be expected, these two tones . 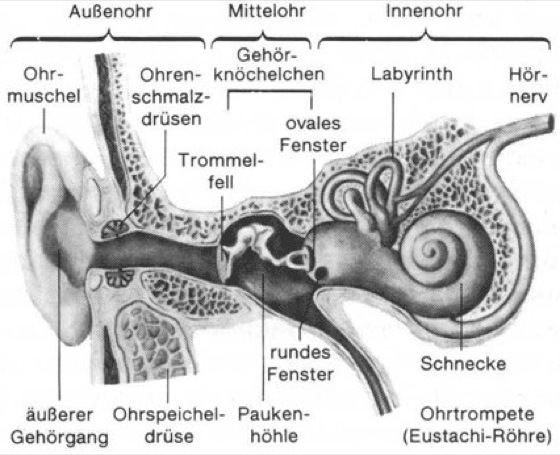 The inner ear then produces its own third tone of 200 Hz, corresponding to the mathematical difference between the two original sounds. The ear emits a precise 200 Hz tone that can be registered by an in-ear microphone. When doctors do hearing tests on babies, such a procedure or measurement is used as an integral part of their examination. This means that composers can use certain tones in their works and predict that listeners’ ears will add their own extra sound dimension when they hear the music. At a particular volume and within particular frequency bands, listeners can even feel a buzzing in their ears as response to the stimulus sounds! It’s truly astonishing what our ears can do! Such insight brings a new and fascinating level into making and listening to contemporary music. If we understand and use the ear not merely as an organ of hearing but as an instrument in its own right, as listeners we can then make new and unprecedented experiences with sound and music. Had all of this not been so conclusively explained by science, we could easily speak of a miracle. Yet we honour it by offering our undivided attention and our love to the gift of musical sound whenever it is appropriate and possible to do so. If you would like to learn more about this dimension of the abilities of our ears, and also like to try a few auditory examples for yourself, I warmly recommend the below article by Brian Connolly, from which the information given here is taken. One day when I asked OUBEY just what “27 Cube Memory System” – the title of the only triptych he ever painted – actually meant, he gave me a very special kind of look and shot back, “You’d better ask Fritz Haller about that”. And that was the end of that until 2005, one year after OUBEYs untimely death, when I drove to Bern with the original triptych packed in the boot of my car to see Fritz Haller and ask him this question. OUBEY in the Internet – now on Pinterest, too! The most important channel for the OUBEY MINDKISS Project to reach out to people has been, and will remain, the internet.